This is my fourth A. Meredith Walters book and I am just as blown away with this was as I was with my first one. 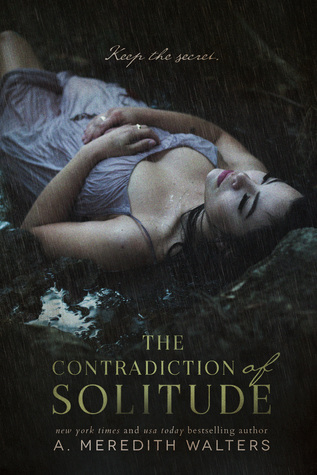 The Contradiction of Solitude was lyrical and poetic. It was bone chilling and eerie. It was satisfying and dark. By the end I couldn’t believe what I had just read. Every time I pick up one of A. Meredith Walters books I get excited and giddy because her writing is THAT good. I say that with complete confidence. It’s just that good. From the first page to the last page. Layna was my favorite. Her unreliable-ness was suffocating but suffocating in a way that trapped me what a FUN and different character she was. The alternating POV’s were ingenius to the fact that we NEEDED to have Elian’s POV just as much as we needed to have Layna’s and the author didn’t disappoint. She gave you just what you needed at just the right time. The title isn’t ironic. Because just as it says the word “contradiction” that is what your feelings during this book will feel like. You will feel full of contradictions in the best way possible. You’ll feel remorse and sadness and overwhelming urges of angst and belonging. Basically, I liked this book because of the tone of the book. The darkness and the haunting. I felt that same haunting long after I put the book down. You feel it in your bones for having such compassion for Layna or longing for Elian. Because once you hit that end you’re just so…whole. It’s one big circle and it all comes together.